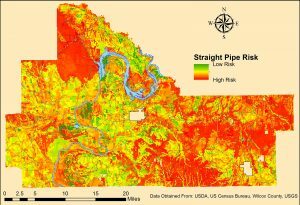 This map shows the risk of straight pipe wastewater drainage from properties not connected to a sewer system in Wilcox County, Alabama. TUSCALOOSA, Ala. — Researchers from The University of Alabama are shedding light on the issue of raw sewage draining into waterways of the state’s Black Belt region, a problem garnering international attention. Graduate student Aaron Blackwell, left, shown working with fellow graduate student Parnab Dason on an earlier project studying straight pipe drainage . The $15,000 grant to UA comes through EPA’s People, Prosperity, and the Planet, or P3, program. 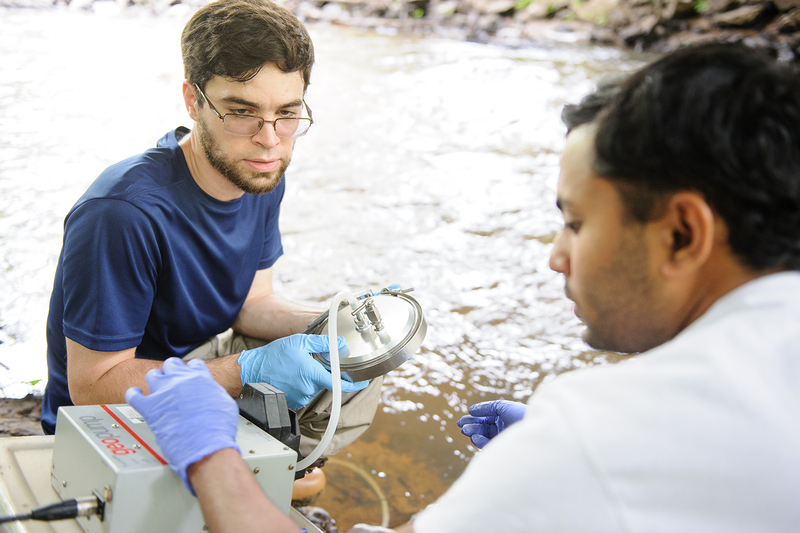 Research teams receive funding to develop sustainable technologies to help solve environmental and public health challenges. The P3 competition challenges students to research, develop, and design innovative projects that address a myriad of environmental protection and public health issues. UA’s team is in the first phase of the program, and it will attend the TechConnect World Innovation Conference and Expo in Boston, Massachusetts in June to showcase its research. The team can then apply for a second-phase grant for funding up to $100,000 to further the project design. Other members of the team include Dr. Joseph Weber, UA professor of geography, Dr. Sagy Cohen, UA associate professor of geography, and Rebecca Greenberg, a UA graduate student studying geology.